As a business owner in the service industry I generally settle disputes with companies and customers amicably as I know how damaging a disgruntled customer can be, and generally give credit where credit is due, those of you that know me may attest to that but when I recieve an email to a query on items I order and paid for like so: I lose hope in customer service. "Its says grit guard and bucket, not grid guard , bucket and gamma seal lid, and besides I wasn't even the owner of the store, any ways the best I can do is place your order and if its decent enough ill send you the lids"
I ordered 2 of them (12 June) last year, I recieved it all, albeit the order was forgotten, lost took forever to dispatch eventually I arranged my own courier to go collect (28 July), I was given some extra stuff as an apology that wasn't nessasary as the apology was forthcoming and sincere. Trouble was I didn't recieve the lids. When I queried it I was told the chemical guys supplier had ordered the buckets without the lids for some strange reason but would get them as soon as they were recived by poor boys. I followed up again in september-ish and was told they had been ordered and will be arriving soon, I then followed up with Chemical guys who told me that that 80% of the lids were stolen by customs? I honestly forgot about it, but since have completed my workshop and planned to store the quick car wash stuff in the buckets to be easily used so queried it again and was told I'll need to pay for the lids, when I forwarded the order I get that reply, IF my order is good enough? Besides I wasn't even the owner? Did poor boys offer the special? did I pay poor boys? is it still poor boys? I'm not sure about the rest of you but it doesn't sit well with me. The original offer in June last year (2009) definitely shows a lid and i mentions the lid in the write up so you should have got a lid. No argument about that. You say you followed up in "September-ish" but you don't say what year - I assume also 2009? But it is now October 2010 and in the meantime Don has sold Poorboys and ridden off into the sunset so it is a little unfair to be pushing the new owner a year later. I understand that you feel short changed and it is a bit ridiculous that CG ordered the buckets without lids. Can you not source a lid somewhere else? well lets hope the poor-boys owners read this and put things right. So should I be accepting the company changed ownership and hence lose out? I have since discovered that the business wasn't exactly sold, and Naushad didn't exactly get a good deal so I can kind of understand his hostile disposition but don't think it fair to be loading a good or bad deal onto an existing customer? I haven't had an issue about paying, but an explination with an apology would have been great, instead I have been met with an odd reaction. Anyway further discussions by email with Naushad, he has decided that I have threatened him in some way and would like me to come pick up lids from him where he'll be waiting. Oh then I was told he has no lids... so I'll wait till he has then I'll go collect, and pay if need be. Sorry I didnt reply sooner, wasnt ignoring you, just havent had access to email. The Chemical Guys supplier ordered the buckets without the lids for some strange reason. I'm trying to source the lids and insert that clips on top of the bucket. I'll keep you posted. The new order for stock will go in within the next month or two, and will include lids. I'll let you know when I have them and will send you 2. 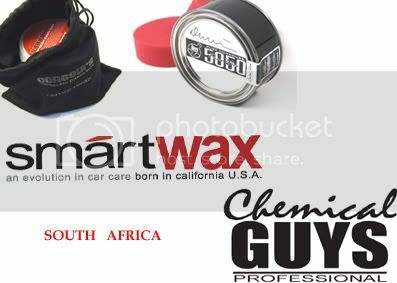 I must apologise on behalf on Chemical guys SA, Unfortunately we are totally sold out on lids and will have stock in a month or two. 80% of the lids brought in were stolen in customs. However if you are willing to wait two weeks or so I can order the lids from the U.S and have air freighted to your address. This will take maximum two weeks. I will get back to with a costing by this evening. Sent from my BlackBerry® wireless device"
- I reply- "LOL Nice try, you owe me from when I bought the bucket kits!!!" This is odd. I've only received good service from Naushad. Hope you get it resolved soon. Nice to see you back again Graham, albeit for the wrong reasons! I've been meaning to ask you if you have ever considered corporate carwashing, it's a bit of a ballache with keeping the water contained but seems like decent money. Thanks for that Carn, As you all know we strive to exceed customer satisfaction and 99.99% of our customers agree with that. However Graham Savage seems to have some personal issues with Don. He said he wanted an order and i told him if it was decent enough id send him the lids no problem at no charge.Which is fair knowing that he had an agreement with don.Even if Savage had to just place a R300.00 order he would`ve got his lids with a lot of freebies for the miss hap.In any case where don had done a dealing and explained to Mr.Savage the miss hap with the lids Graham agreed to take the order with dons explination.Im sure don would back me up on this.How ever you may come and pick up your lids at my office. Thanks Naushad, that makes alot more sense to me.